Louise Linton, Treasury Secretary Steven Mnuchin's wife, has issued an apology after setting social media abuzz with her Instagram couture hashtags and condescension toward another user Monday. 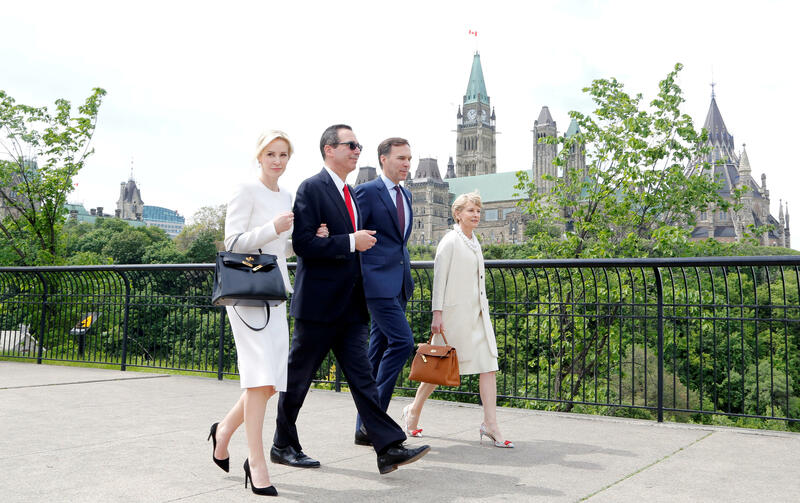 After a visit to Louisville, Kentucky with Mnuchin, Linton posted this Instagram about her "great #daytrip" -- and she added hashtags highlighting her designer garb and accessories: Roland Mouret pants, Tom Ford sunglasses, Hermes scarf and Valentino heels. Soon after, another user responded, "Glad we could pay for your little getaway. #deplorable." The comment bothered Linton enough so that she wrote a lengthy and condescending reply punctuated with emojis to jennimiller29. "Aw!!! Did you think this was a personal trip?! Adorable!" Linton wrote. "Do you think the US govt paid for our honeymoon or personal travel?! Lololol. Have you given more to the economy than me and my husband? Either as an individual earner in taxes OR in self sacrifice to your country? I'm pretty sure we paid more taxed toward our day 'trip' than you did. Pretty sure the amount we sacrifice per year is a lot more than you'd be willing to sacrifice if the choice was yours. You're adorably out of touch. Thanks for the passive aggressive nasty comment." Linton even took the trouble to look at the social media account of her critic. "Your kids look very cute. Your life looks cute. I know you're mad but deep down you're really nice and so am I," she continued. And she advised, "Sending me passive aggressive Instagram comments isn't going to make life feel better. Maybe a nice message, one filled with wisdom and hunanity [SIC] would get more traction. Have a pleasant evening. Go chill out and watch the new game of thrones. It's fab!" Tuesday afternoon, after backlash over the remarks blew up online, Linton issued a statement saying: "I apologize for my post on social media yesterday as well as my response. It was inappropriate and highly insensitive." Linton's Instagram account is now private. The Daily Beast's Betsy Woodruff noted on Twitter that after she had pointed out Linton's post, Linton edited the photo caption. The new one still praises the people and countryside in Kentucky but omits the mention of the expensive designerwear. Jenni Miller, a Democrat, told the New York Times that "if she hadn't made her account private, I would have written back with a very snide Marie Antoinette joke," although she also said that she regretted letting Linton get to her. The Treasury Department told the Times that the Mnuchins reimbursed the government for the trip and that Linton received no compensation by any of the designers she mentioned in her post. Linton, a Scottish actress, and Mnuchin were married in Washington, D.C. in June.